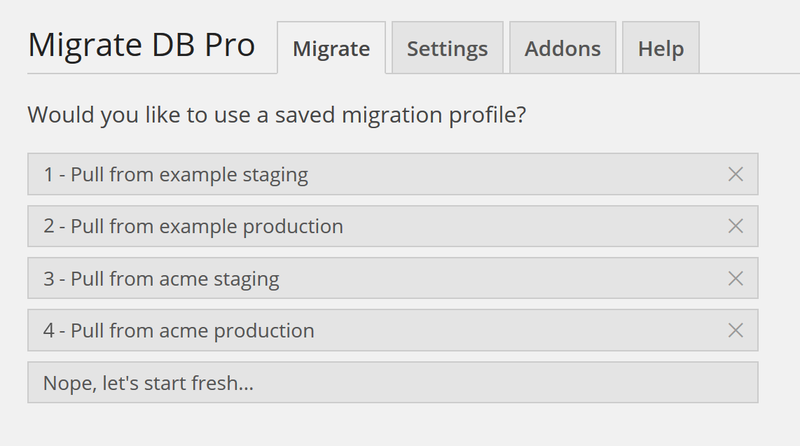 Allows you to run a migration with a saved migration profile. The migrate subcommand is an alias. profile_id – ID of the profile to migrate. See below for how to find the profile ID. Navigate to the WP Migrate DB Pro plugin page (Tools → Migrate DB Pro) to access a list of your migration profiles. You’ll find the migration profile ID to the left of the migration profile name. In the screenshot above, the ID for the profile “Pull from acme staging” is 3.